Let's start with the trigger-warning. I'm not thinking about the violence—which is pretty much what any reasonable reader would expect, having embarked on a novel called Werewolf Cop—nor am I worrying about sensitivity to "the occult" (ditto). But there are other elements in the book that could take a reader by surprise, leading to trauma. For instance: The protagonist, Zach Adams, a detective in a rather mysterious elite squad, is married to a woman who stays at home with their two young children, a strong, sweet woman, a Bible-reader, "religious in the same beat-by-beat scriptural way [Zach's] own mama had been, the way he assumed a good woman was supposed to be." Some readers, I'm sure, are already feeling a bit nauseated and a bit angry at the same time—and I haven't even mentioned the name of Zach's "Proverbs 31 wife": Grace. She is not phony, she is not a prig, she does not secretly hate her life. So be warned: this book is LOADED with provocations. The French have Michel Houellebecq; here in the US of A, we have Andrew Klavan. But Klavan is not only a provocateur—he's also, Stephen King says, "the most original American novelist of crime and suspense since Cornell Woolrich." And Werewolf Cop (so I say) is his best book yet, one that starts with a rush and never lets up, dark and funny, with the bittersweet taste of the knowledge of good and evil. Many classic stories give us a protagonist whose everyday existence is vividly rendered—yes, yes, we say, recognizing the familiar contours—only to be overturned. All of a sudden aliens are landing, or someone has mistaken you for a spy and you find yourself on a flight to Beirut. Werewolf Cop follows this pattern: we follow Zach from the murder-scene he and his partner are called to at the outset, confident and supremely competent, through a series of bewildering events that lead him (as he looks back) to try and identify "that decisive instant when his life detached itself from the gravity of natural things and floated into the deep space of the uncanny." But here's the point: this isn't just a literary strategy to get the plot rolling. "Natural things," Klavan wants us to see, point beyond themselves, if we are paying attention. That—as Joseph Ratzinger said in his Introduction to Christianity, written before he became Pope Benedict—is the very essence of the human condition. "If you believe in God," a German woman named Gretchen Dankl tells Zach, "the evidence of Him is all around you. But if you do not believe, no evidence can ever be enough." Or, in the words of Fatboy Mooch (a crime boss who swaggers onto the page and makes you wish he had more screen-time), "They an invisible war going on out there, Detective … . We ain't fighting against flesh and blood no more." I've tried to give you a sense of the book without giving away how it unfolds—that's for you to find out, if you think this might be your cup of tea. 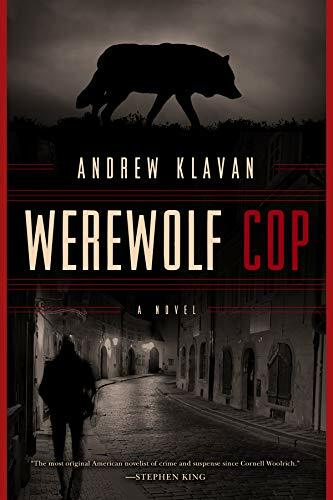 And if it is, as I hope, you might then pick up a copy of Klavan's 1998 novel The Uncanny (you'll discover some connections between that book and Werewolf Cop). Of course, you may be too sophisticated to read a book with werewolves and a dagger that Hitler tried to get his hands on. You may not like Grace. (What's a woman like that doing in a novel published in 2015?) But if, on the other hand, you've experienced—like Zach—"a sickness of complete unknowing," you may want to take this wild ride. Copyright © 2015 Books & Culture. Click for reprint information.